Terri Seymour was on the set of Fashion Star yesterday to interview Nicole Richie. Terri tweeted how 'cool and down to earth' Mrs Richie is - I couldn't agree more! Nicole Richie wore a striking YSL leopard print dress on the set of Fashion Star. 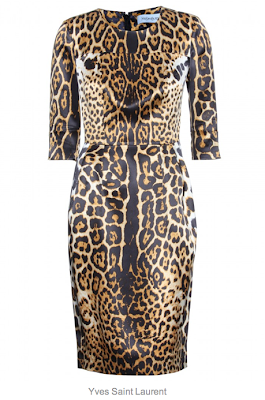 You can shop Nicole Richie leopard YSL dress at MyTheresa for £1,125. Or you can go for the 'look for less' with this Project D dress for a fraction of the price. Nicole completed her Fashion Star look with some House Of Harlow jewels! I really love Nicole's style, but in this picture I prefer the other girl's outfit!